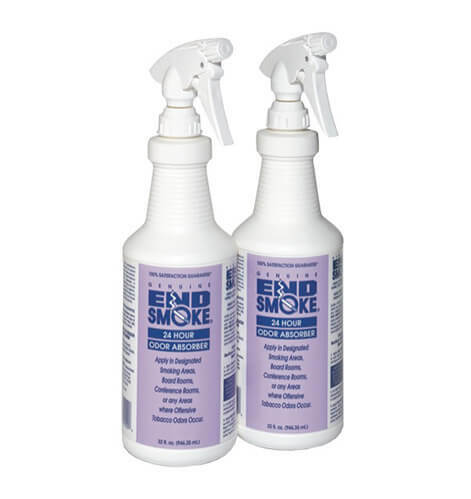 Make EndSmoke® a part of your janitorial arsenal and permanently rid your environment of smoke odors for good. EndSmoke’s non-aerosol spray instantly neutralizes residual lingering smoke odors in ashtrays, waste cans, most soft furniture, walls, ceilings, draperies, clothing, etc. Each application lasts 24 hours or more and it’s V.O.C. compliant. EndSmoke is highly effective for any commercial or industrial space. Unlike common air fresheners that are sprayed into the air and dissipate within minutes, and EndSmoke’s unique surface-spray method neutralizes telltale tobacco odors at their sources and actually prevents new tobacco odor problems from occurring. Read more about the origination of EndSmoke, how it works and how it’s become the industry choice for smoke odor elimination. Apply In Any Interior Where Tobacco Odors Occur. EndSmoke® can be applied in any designated smoking areas, board rooms, conference rooms, or any areas where offensive tobacco odors occur. Apply directly to odor sources such as clean ashtrays and waste containers. BEFORE USING ALWAYS TEST FABRIC OR SURFACE IN AN INCONSPICUOUS AREA FOR COLOR FASTNESS OR ADVERSE REACTION. Do NOT apply to white or light colored fabrics, painted, varnished or plastic surfaces. Apply to porous surfaces where smoke odors linger including: draperies, carpets, upholstery, walls, acoustic ceilings, autos, head- liners and upholstery.